Includes 3 day $125 training fee + $500 exhibitor fee. Does not include 2017-2018 membership. 3 Day - Includes 2017-2018 membership. Lodging/meals separate. 1-Day - Includes 2017-2018 membership. Lunch/dinner provided. Retired Member 3 Day - Does not include 2017-2018 membership. Lodging/meals separate. Exhibitor Registration - Includes 3 day $125 training fee + $500 exhibitor fee. Lodging/meals separate. Online registraton is now closed. Please complete all registrations at the conference. Conference registration will close on April 19th, 2017. If after that date you are still interested in attending, please visit the Registration table in Golf Villa A & B when you arrive at Madden's and register as a "Walk up". A $30 late fee will be assessed. Full payment is required at the time of registration. Paying via Paypal is and will be available on site. Please review MAFAA's refund policy, prior to registration. View Cancellation and Refund Policy. If you are attending the full 3 day conference, meals/lodging are arranged separately through Madden's. 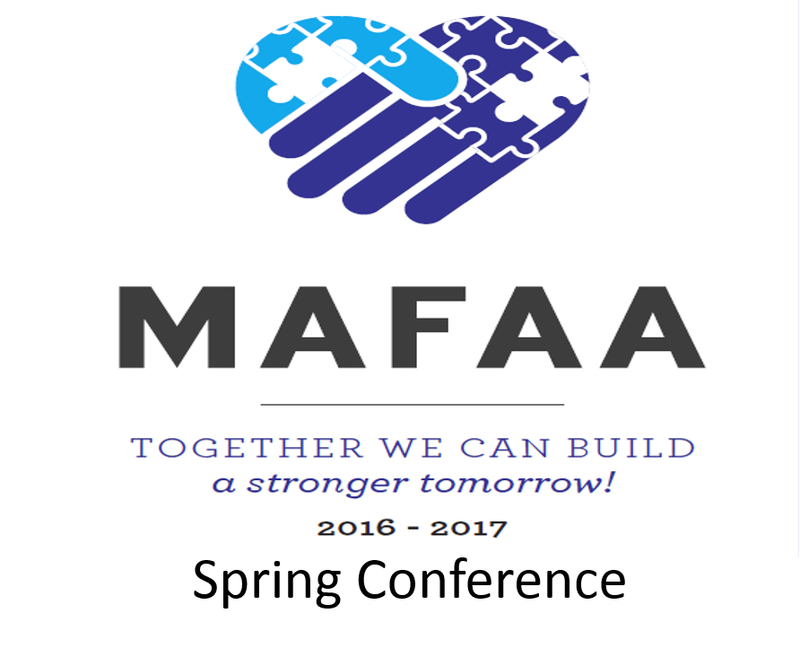 Please contact the Madden's Reservations Department at (800) 642-5363 and ask for a reservation for the MAFAA Spring Conference. Make your Madden’s reservation online here. **PLEASE NOTE MADDEN'S PAYMENT POLICY: Full package payment is required at the time of a reservation request. When a credit card is used, the card will be debited the required amount when the payment is processed. A check can be issued to Madden's to replace a credit card payment at the time of check in. Please remember to register separately for both the conference and for your room/meal reservation at Madden's. To get the Madden's special conference room rate, you need to reserve your room by April 4th, 2017. Meals are NOT part of the MAFAA registration, but are a part of the Madden's package. A Madden’s PDF form is available at the link below providing detailed accommodation information and pricing. You may print and fax this form to Madden's to make your reservation. Make your Madden’s reservation online here. To make reservations by phone, please call Madden's Reservations Department at (800) 642-5363 and ask for a reservation for the MAFAA Spring Conference. **PLEASE NOTE MADDEN’S PAYMENT POLICY: Full package payment is required at the time of a reservation request. When a credit card is used, the card will be debited the required amount when the payment is processed. A check can be issued to Madden’s to replace a credit card payment at the time of check in. o Established in 1971, the Autism Society of Minnesota (AuSM) is a non-profit organization committed to education, advocacy and support designed to enhance the lives of those affected by autism from birth through retirement. Whether you are a family with a child who is newly diagnosed, an adult who is on the spectrum, an educator who serves individuals with autism, or a corporation that wants to learn more about employing individuals with autism, AuSM provides you with the resources and services you need to help you accomplish your goals. Your AuSM membership also guides your path into the autism community, helping you find the most comfortable way to participate and grow. AuSM offers a place to learn, access services, and develop skills that enhance your life. AuSM membership connects you to a common community that acts without judgment, nurtures potential, advances knowledge, and builds awareness. o By partnering with Autism Society of Minnesota, MAFAA members can help build a stronger tomorrow for countless Minnesota families. Training attire is “casual”. At the MAFAA banquet, we will be continuing with our theme of “Together we can build a stronger tomorrow” with casual attire and games following the meal. When attending training sessions, please turn your cell phone to silent. When attending sessions, please make alternative arrangements for child-care and/or family who may elect to join you during your stay in Brainerd. Reminder: It is always advisable to bring a sweater or light jacket. Some of the presentation rooms might get chilly! For the presenters: we are asking that all presenters use the provided PowerPoint template for all 2017 Spring Training presentations. Download the PowerPoint template here. Exhibiting opportunities for the MAFAA Training are available. Exhibitors who have not yet completed the online Corporate Support application should do so now. A special THANK YOU goes to all the exhibitors and sponsors who contribute to the success of MAFAA! Questions on exhibiting at the conference can be directed to Gayle Yamry. Are you excited to attend MAFAA’s Spring Training this May but not sure your manager will approve the time gone from the office or the expense? MAFAA has provided you with an editable letter for you to use to justify the training.